Dallas joined our family from Texas in July. He was kept on a farm and never raced. He is a healthy boy, and our volunteers have been working with him for over 4 months to socialize him and get him ready to find his forever home. Actually, he has had a couple of home trials that weren't right for him. 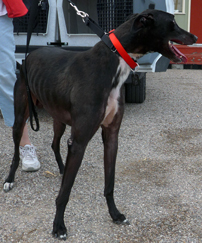 He needs a home as an only dog or with other greyhound(s). Also Dallas has an old Achilles tendon injury and needs an anti-inflamatory when it flairs. He will be adopted as a special needs hound for a fee of $285. Please open your heart to this lovely boy!